Ankle sprains are some of the most common sports injuries, often recurring again and again. In most cases the ankle is rolled outwards, resulting in damage to the lateral ligaments on the outside of the ankle. This is known as an inversion ankle sprain. A sprained ankle can be troublesome and cause long-term problems if not treated correctly . Other complications or injuries may occur at the time of a sprained ankle and not be noticed until much later. We explain ankle sprain symptoms to help you determine the extent of your injury, as well as information on treatment, exercises and tips on preventing ankle sprains. Ankle sprain symptoms may vary from being very mild to severe. With a mild sprain the athlete will likely be able to continue with training or competition. A very severe injury will result in hospital treatment and take longer to heal than a broken ankle. An ankle sprain will usually occur from a sudden trauma, twisting or turning over of the ankle. Pain will be felt in the ankle joint itself although pain will specifically be felt on the outside of the ankle when pressing in on the damaged ligaments. Swelling or bruising may be present but not always in the more mild cases. Ankle sprains are graded 1,2 or 3 depending on severity and a professional therapist will carry out a full diagnosis and ankle sprain assessment which will include range of motion tests and resisted movement tests to determine the structures injured and extent of the damage. There will be only mild pain with little or no instability. Some joint stiffness or difficulty walking or running but the athlete may be able to play on. 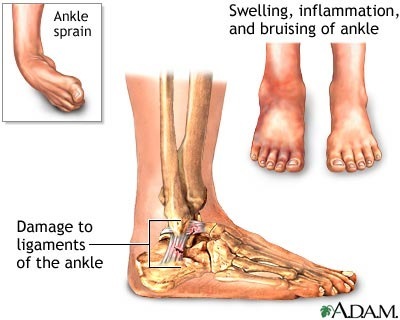 Some stretching or perhaps minor tearing of the lateral ankle ligaments may have happened resulting in mild swelling around the bone on the outside of the ankle. Moderate to severe pain and difficulty walking. The athlete is unlikely to be able to play on and will limp. Minor bruising may be evident along with swelling and stiffness in the ankle joint. There is likely to be some instability of the joint resulting from moderate tearing of some of the ligament fibers. This usually results in a total or almost complete rupture of a ligament. Severe pain will be felt initially but later by no pain. The athlete will experience gross instability of the joint. Severe swelling will be seen with extensive bruising. In addition to the ligament damage there may also be damage to tendons, bone and other joint tissues, which is why it is important to get a professional to diagnose your ankle sprain. If possible an X-ray should be done, as small fractures or avulsion fractures where a tendon or ligament pulls a small piece of bone away are not uncommon. Osteochondral lesions (tears of the cartilage lining the top of the Talus) are also frequent complications of moderate to severe ankle sprains. Severely sprained ankles, where there are complete ruptures of the anterior talofibular, calcaneofibular and posterior talofibular ligaments, result in dislocation of the ankle joint which are often associated with a fracture. Treatment of a sprained ankle can be separated into immediate first aid and longer term ankle rehabilitation and ankle strengthening. When considering how to treat a sprained ankle the aims should be to reduce pain and swelling then restore full mobility and strength. Immediate First Aid for a sprained ankle: Aim to reduce the swelling by RICE (Rest, Ice, Compression, Elevation) as soon as possible. R is for rest. It is important to rest the injury to reduce pain and prevent further damage. I is for ICE or cold therapy. Applying ice and compression can ease the pain, reduce swelling, reduce bleeding (initially) and encourage blood flow (when used later). Apply an ice pack or similar immediately following injury for 15 minutes. Repeat this every 2 hours. C is for compression – This reduces bleeding and helps reduce swelling. A compression wrap is excellent for providing support and compression to a recently injured ankle. Alternatively an ankle support which compresses the joint is effective at reducing swelling. E is for Elevation – Uses gravity to reduce bleeding and swelling by allowing fluids to flow away from the site of injury. So put your feet up and get someone else to wait on you! It is recommended that a physician undertake a thorough assessment of the injury so time is not wasted treating the wrong condition and hopefully any complications can be identified early on. A doctor may prescribe anti-inflammatory medication (e.g. ibuprofen) to help with pain and swelling. Swelling can be reduced by using compression casts or applying ankle wraps and bracing. Specialist cryotherapy devices which apply cold and compression automatically are used widely by professional sports teams. It is sometimes necessary to immobilize the ankle in a cast or cam boot to allow the ligament to heal. Following the initial treatment of a sprained ankle, it is important to see a physical therapist as there are other treatments that can help the ankle return to normal as soon as possible. Ankle sprain exercises such as can help to get the ankle moving again, as well as reducing swelling if performed with the leg elevated. In the early stages only exercises involving up and down movements which will not stress the ligaments should be done. See our ankle sprain rehabilitation program for more details. A wobble board is an important part of rehabilitation of ankle sprains. Use ultrasound and laser treatment to reduce pain and inflammation and promote healing. Use cross friction massage to promote healing and reduce scar tissue development.This may be important if the injury has become chronic or isnt healing properly over time.